The number of American seniors is expected to reach 70 million by the year 2030, according to the U.S. Census. AARP reports that as many as 90% of people over the age of 65 are focused on living independently and live in their home for as long as they can. We get it. Living independently has its perks, including staying in the comfort of your home with all its amenities, maintaining your privacy, and continuing to do the things you love. There is no doubt the aging-in-place movement promotes senior self-reliance! Advancements in technology, home modifications, and in-home senior assistance services have this growing segment of the American population proving that they can retain some level of independence. Technological advancements, especially related to senior devices and gadgets, are allowing elderly people to age at home. Tools, equipment, and Apps are being geared toward ensuring their safety as they continue to live on their own. Personal medical alert systems allow seniors to summon help quickly should they fall or need medical attention. Video monitoring allows family members to visually monitor their aging loved in real time. This trend has been gaining popularity over the last few years as families spread out geographically. Other systems are changing how older people age at home, including digital pill dispensers; voice-activated talking clocks that remind seniors to eat, take a short walk or even feed the cat; and GPS devices that call for the help of a response team and alert the family to the potential health or safety issue. FirstLight Home Care has joined forces with Constant Therapy, a cognitive, speech and language therapy mobile app that allows users to access 80+ evidence-based brain tasks from a tablet or smartphone while at home or in a healthcare facility. We’ve also partnered with TruSense, a smart home monitoring solution that uses sensor and GPS technology to provide insights into the health and well-being of a loved one. We think these are valuable advancements that not only help keep seniors safe but also give peace of mind to families. The desire to age in place may not work if the home an aging loved one is living in cannot accommodate the changes that come with growing old. However, sometimes minor adjustments can enable them to live safely in their homes. For many aging family members, having someone to help them with weekly tasks and activities can mean the difference between living on their own and having to move into an assisted living facility. 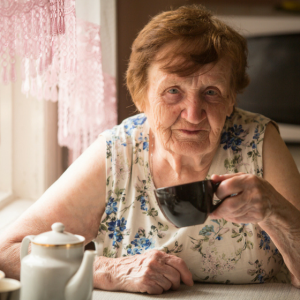 Are you or a loved one over the age of 65 and living independently? Share your tips and advice on how you’re aging in place (and loving it) on our Facebook page.